I have listed a new property at 1103 2165 40TH AVE W in Vancouver. I have sold a property at 7327 MAGNOLIA TERR in Burnaby. MONTEREY. Quality two bedroom, two bath townhouse by Adera. This is a quiet and bright, inside courtyard, south facing home. There are cozy bay windows with seats perfect for relaxing with a book or tablet.All new floors in this great layout and a sunny private rooftop deck with views to the south. Good size bedrooms, nice living and dining space with a functional kitchen. One parking space and one storage. Close to the biking path, Highgate and a short skytrain ride to metrotown or downtown. YOU'LL LOVE IT! VANCOUVER, B.C. 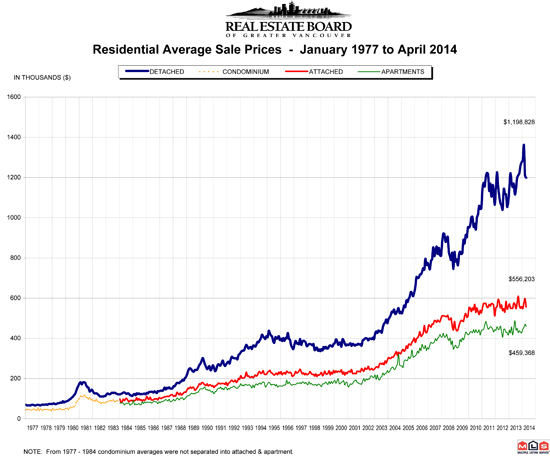 – May 2, 2014 – Home buyers and sellers became more active in the Greater Vancouver housing market in April. The Real Estate Board of Greater Vancouver (REBGV) reports that residential property sales in Greater Vancouver reached 3,050 on the Multiple Listing Service® (MLS®) in April 2014. This represents a 16.1 percent increase compared to the 2,627 sales recorded in April 2013, and a 15.5 percent increase compared to the 2,641 sales in March 2014. Last month’s sales were 5.2 percent below the 10-year sales average for April of 3,217. The sales-to-active-listings ratio currently sits at 19.7 percent in Greater Vancouver, which is the highest this measure has been since June 2011. New listings for detached, attached and apartment properties in Greater Vancouver totalled 5,950 in April. This represents a 1.3 percent increase compared to the 5,876 new listings in April 2013 and a 12.7 percent increase from the 5,281 new listings in March. Last month’s new listing count was 1.2 percent higher than the region’s 10-year new listing average for the month. The total number of properties currently listed for sale on the MLS® system in Greater Vancouver is 15,515, a 7.3 percent decline compared to April 2013 and a 7.2 percent increase compared to March 2014. The MLS® Home Price Index composite benchmark price for all residential properties in Metro Vancouver is currently $619,000. This represents a 3.6 percent increase compared to April 2013. Sales of apartment properties reached 1,172 in April 2014, an increase of 11.4 percent compared to the 1,052 sales in April 2013, and a 1.5 percent decline compared to the 1,190 sales in April 2012. The benchmark price of an apartment property increased 2.6 percent from April 2013 to $375,500. Attached property sales in April 2014 totalled 542, a 6.1 percent increase compared to the 511 sales in April 2013, and a 12.2 percent increase over the 483 attached properties sold in April 2012. The benchmark price of an attached unit increased two per cent between April 2013 and 2014 to $464,400.